An elaborately dressed Indian man clad in beaded leggings and moccasins, short skirt over long loin cloth, vest, hairpipe necklace, face paint, and a feather and scalp headdress, also carries a feather fan. The label reads, “Ollie,” although this contradicts Dr. Tips assertion that the creator of the ledger drawings was Ollie. The fact that the figure depicted is wearing masculine apparel, including a loin cloth, indicates it a man rather than a woman. 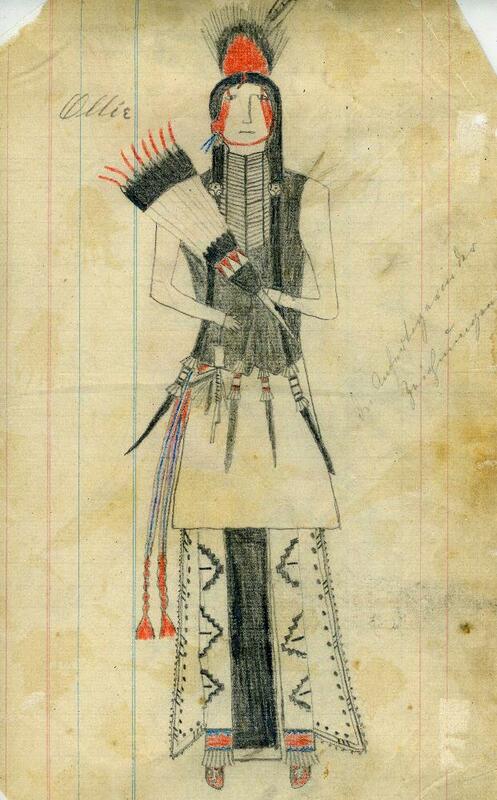 Father Peter Powell suggests that the costume dates to the reservation era, circa 1880. TARL Archives.